This is a copycat recipe of a copycat recipe, but I think it’s as close to a low-carb version of Olive Garden’s Zuppa Toscana as we’re likely to get. It was good as a meal all by itself, or it would also be great served in smaller portions with a salad. Microwave 6 slices of bacon until they’re reasonably crisp, cut them into small pieces, and set aside. In a large pot. break up the cauliflower into bite-sized pieces. Add the water and chicken broth and cook over med-high heat for 15-20 minutes until it’s soft, but don’t cook it until it’s mushy. While the cauliflower is cooking, chop the onions and slice the sausage. Saute them together until the onions are translucent, and set aside. When the cauliflower is soft, remove about 2/3 of it with a slotted spoon. I just put it into the pan with the cooked onions and sausage. Add the roasted garlic to the rest of the cauliflower in the pot. (If you don’t have any available, cook 1 T. of minced garlic with the onions and sausage.) Puree the garlic and cauliflower in the pot with the liquid. 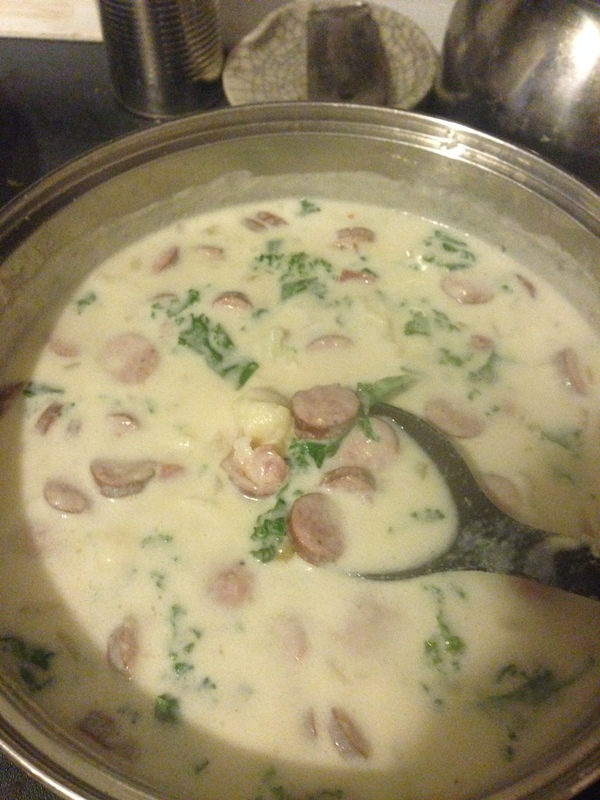 When it’s completely smooth, add the cooked onions, sausage, cauliflower pieces, and bacon. Add the kale and cook the soup for an additional 5 minutes. Add the cream and Parmesan cheese, and stir until combined. Season with salt and white pepper to taste. You may not need any salt at all, but to each their own. Crumble in one large pinch of Herbes de Provence. Don’t go too heavy or it will overpower the soup. The last step is to lightly sprinkle a little xanthan gum in the pot and mix it in well. You don’t want it to thicken the soup too much. It’s mostly to keep the cheese and cream from separating.